If we become more aware of how early experiences with alcohol affect young people’s choices later in life, we may be able to prevent many of these problems from starting. Alcohol.org’s study found that starting to drink before age 21 increases your chances of binge drinking. Those who tried their first drink before age 21 were almost twice as likely to binge drink in their first year of alcohol consumption compared to those who waited until after they turned 21. This finding applies to most young people, considering that the vast majority of respondents, 91 percent, tried their first drink before they were 21. Interestingly, the study also found that the type of alcoholic drink a person first tried affected future drinking patterns. If your first drink was beer, you are 50 percent more likely to drink more than people who first had wine, a mixed drink or liqueur. The study respondents whose first drink was beer now drink on average 9 alcoholic beverages per week. 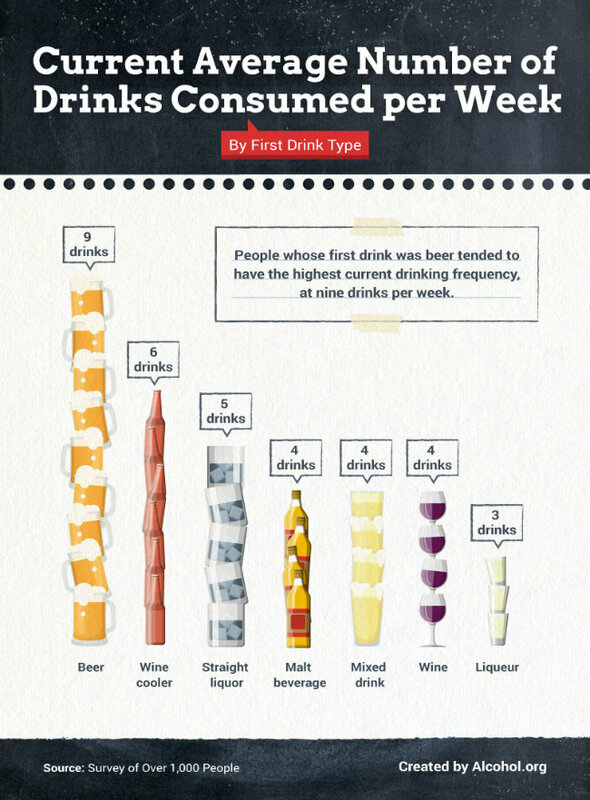 Whereas, those who started with wine or mixed drinks now only have 4 drinks on average per week. And those 9 drinks per week can be a problem. The Centers for Disease Control (CDC) defines excessive drinking as having more than 8 drinks per week for women, and more than 15 per week for men. Whether these are consumed in one session of binge drinking, or spread out over the week, it can lead to serious short-term and long-term health risks. Some parents feel it’s best to allow children to drink small amounts of alcohol under parental supervision, rather than forbidding alcohol, which could push them to drink carelessly outside the home. Alcohol.org’s study found the opposite to be true in young children. Children whose parents allowed them to drink alcohol under 13 years old were more likely to binge drink as children than those whose parents forbid alcohol. 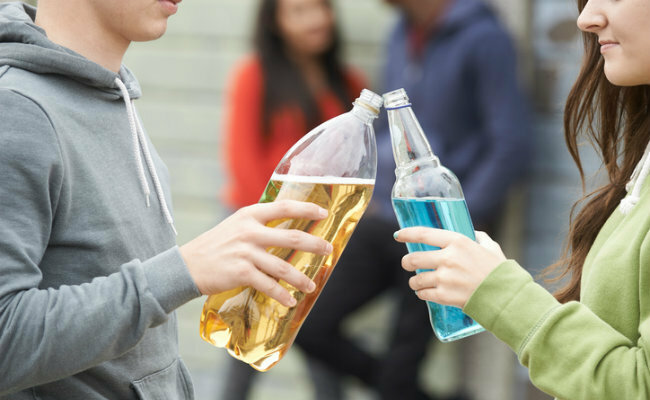 Although, teenagers whose parents allowed them to drink at age 14 and over were somewhat less likely to binge drink in their teenage years than those who were forbidden to drink. If you choose to allow your child to drink, this study suggests there may be a developmentally appropriate time to introduce alcohol. At age 14 and older, young people may be better able to moderate their own alcohol use compared to children 13 and under. This is consistent with other research that suggests young people should not be allowed to drink before age 15 due to potential risks to their developing brain and body. Regardless of whether or not a child is allowed to drink in the home, it’s beneficial for parents to openly discuss alcohol and its effects with their kids. Respondents whose parents discussed the effects of alcohol with them as children were 37 percent less likely to become binge drinkers as teenagers and later in life. Whereas, when parents don’t discuss alcohol and its effects, their children are more likely to drink underage and become excessive drinkers. This has important implications considering that alcohol abuse continues to be a prevalent problem in many countries throughout the world. In the United States alone, the economic costs of excessive alcohol consumption are estimated to be nearly $250 billion per year. This includes health care costs, lost time at work, crime, early mortality and car accidents. Another concerning trend is the rise in liver disease among millennials. A recent study found that deaths from alcohol-related liver cirrhosis in the United States rose by a shocking 65 percent between 1999 and 2016. The study also found that in the past decade, people in the 25 to 35 age range had the highest increase in cirrhosis deaths. It appears that millennials are increasingly misusing alcohol with serious consequences to their health. The study didn’t look at why this is happening, but researchers pointed out alcoholic liver cirrhosis is a completely preventable disease. With greater education about the effects of alcohol, the disease could be nearly eradicated. This highlights the importance of speaking openly about alcohol consumption and how it can impact everyone’s health. We need to have honest conversations with our children, as well as our friends and other family members. And if you personally have concerns about your own drinking habits, please speak to someone you trust or contact an alcohol helpline or support group near you.